One of the nice benefits of the new board changes on Chowhound is that all of Connecticut is now lumped together, rather than Fairfield County being split off and grouped with Westchester and the rest of the NY Metro area. For me, that means I am now exposed to the fact that, apparently, there is food east of Norwalk. In particular, this new board exposed me to the fact that despite my grumblings over a lack of good Chinese in Connecticut, there is allegedly a wonderful Szechuan restaurant just shy of New Haven in the undistinguished town of Milford. For the past few years, people have been talking on Chowhound about this little restaurant called Lao Sze Chuan serves up high-quality authentic Chinese food from Szechuan province. In the middle of Connecticut? To a Westerner it’s a dish that sounds daunting. But put aside the reservations because it’s one of the best cold appetizers I’ve ever had. Of all we tried, this dish best showcased the purity of the Szechuan peppercorn, in all of it’s unique tingly, lip-numbing heat. The tripe had a slight, pleasing crunch, but not chewy or tough at all. The thinly sliced ox tongue had a deep beefy-like flavor, but without being too overpowering. The dish was dressed perfectly by a szechuan peppercorn-infused sauce that cut the richness of the tripe and beef. These Szechuan dumplings were more reminiscent of a ravioli in form than a stereotypical Chinese dumpling. 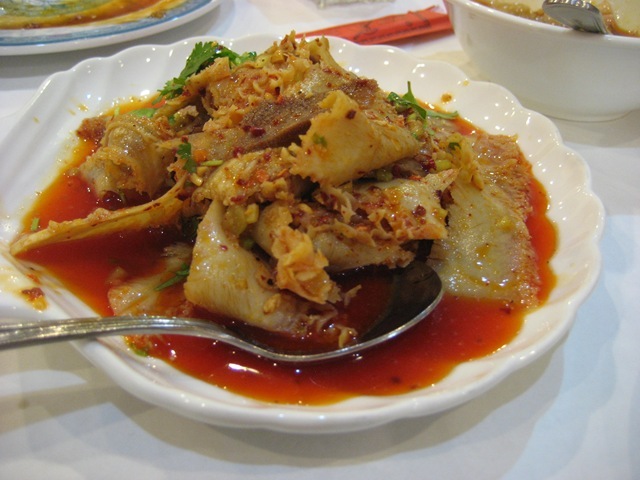 The small pork fillings were wrapped in a thin, rather delicate dough swimming in a black-red chili sauce. All together, it was a nice surprise. Given how good these are, I wouldn’t bother with the regular dumplings here, which were sub par to begin with, let alone compared with the Szechuan dumplings. I’m not sure how particular to Szechuan scallion pancakes are, but we couldn’t resist ordering them regardless. Lao Sze Chuan’s pancakes were far better than your typical suburban Chinese restaurant, packing good flavor with a nice crunch without being overly greasy. That said, their pancakes lacked the flakiness of great scallion pancakes and don’t really compare well to my all-time personal favorites at Nice Green Bo in NYC. Given the other great things on Lao Sze Chuan’s menu, I’d look elsewhere on the menu for appetizers. The proprietor of Lao Sze Chuan strongly recommended we try this dish; I’m glad she did as I would have never tried it otherwise based on the menu’s description. Of everything I tried, this was the best single dish of the night. The sole couldn’t possibly have been cooked more perfectly – large filet chunks, impossibly tender and bathed in a mildly spicy-sweet sauce. 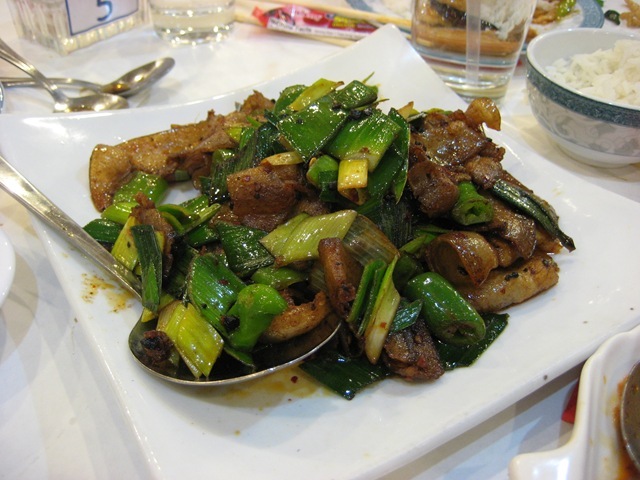 The hearts of palm, garlic and mushrooms filled out the dish to make it a must-try for anyone going to Lao Sze Chuan. Oh, and don’t be daunted by the “Thai” name – it felt Szechuan through and through to me. Despite the name, this was one of the mildest dishes of the night (apparently Szechuan “jalapeños” are milder than their Mexican namesakes). The beef was mildly flavored, but velvety in texture. The peppers gave the dish a very pleasant peppery flavor with a subtle bitter note to the dish. Of the main dishes, this was perhaps my least favorite. But that says much more to the strength of the other dishes than this dish being poorly executed. 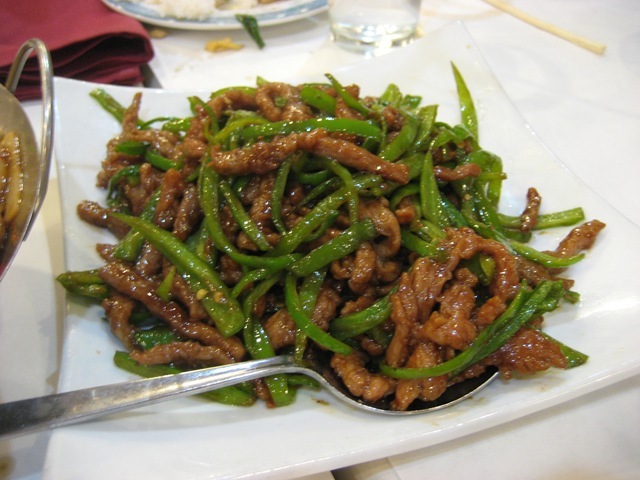 In fact, this dish would be the star at any other Chinese restaurant in Connecticut. The fatty pork (uncured pork belly?) was sliced paper thin taking on a ribbon-like quality. Cooked with traditional Szechuan spices, leeks and peppers this was still a very good dish. (I sold it to my kids as “Chinese bacon”) My only complaint is that, even though well executed, I was still left with too much of a greasy aftertaste. That said, I’d happily take it any other day of the week when I don’t have access to the rest of the menu. To wrap up a wildly long post, if you happen to be within a 45 minute radius of Milford, CT, go to Lao Sze Chuan. You’ll count the time and gas investment well worth it. Yet another exceptional issue, dude. Keep it up. The more sand that has escaped from the hourglass of our life, the clearer we should get a load of because of it. wow must say the food looks really good! I pay a visit every day a few web pages and blogs to read posts, except this webpage gives quality based content. his research for his book “Mormon Country – A summer with the Latter Day Saints”. Ordinary chores make you strive for more and it helps one master a way of life. on. 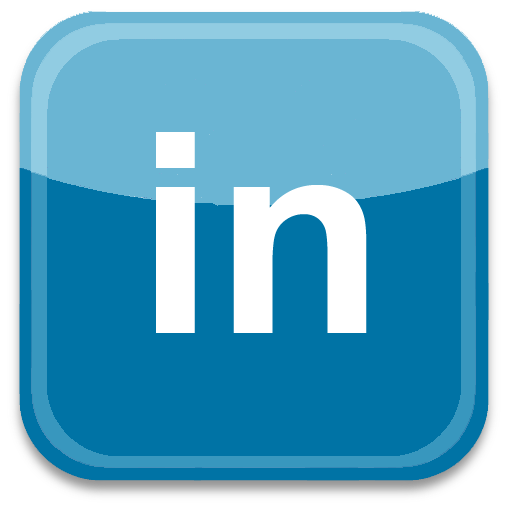 I want to encourage yourself tto continue your great work, have a nice afternoon! thee usual information a perso supply for your guests? Thanks for finally writing about >Authentic Chinese in Connecticut? 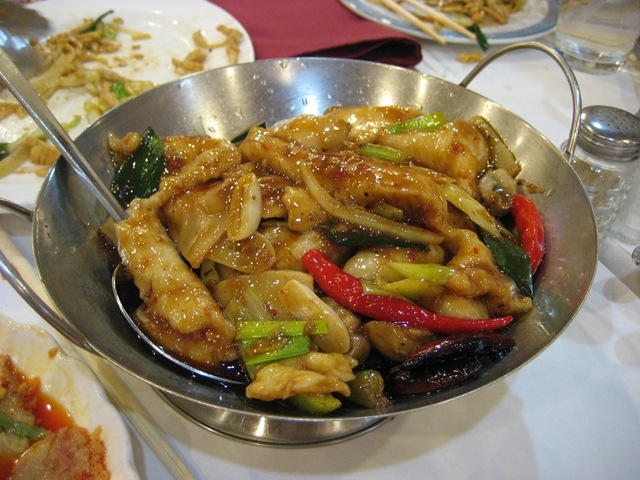 Yes indeed: Lao Szechuan | Adam Christensen <Liked it!